Mitsubishi Electric today announced it has developed a prototype electric vehicle (EV) motor drive system with a built-in silicon-carbide inverter. The EV motor drive system, the smallest of its kind, will enable manufacturers to develop EVs offering more passenger space and greater energy efficiency. 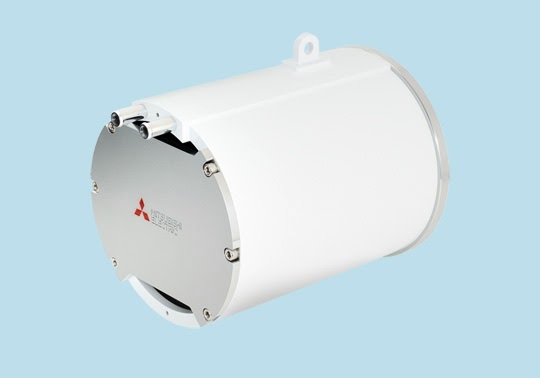 Mitsubishi Electric plans to commercialize its new EV motor system after finalizing technologies for motor/inverter cooling, further downsizing and additional efficiency. - Achieves further system downsizing (14.1L, 60kW) with smaller motor resulting from improved thermal resistance between motor drive system and cooling system. - Equal to existing EV motors in power and volume, enabling replacement. - Integrates cooling system for motor and inverter thanks to cylindrical shape of power module accommodating parallel cooling ducts for motor and inverter. - Ensures stable cooling with even a low-power pump. Global demand for EVs and hybrid EVs (HEVs) has been growing in recent years, reflecting increasingly strict regulations for fuel efficiency and growing public interest in saving energy resources and reducing carbon dioxide emissions. As EVs and HEVs require relatively large spaces to accommodate their robust battery systems, there is a strong need to reduce the size and weight of motor systems and other equipment to ensure sufficient passenger space. Pending patents for the technology announced in this news release number 94 in Japan and 29 abroad.